About owning a Vacation Home in the Riviera Maya, México. This article was written by Alain Phillips a Real Estate Professional Advisor and Life Coach that has been in the Real Estate Business for the last 10 years. His Real Estate family business has been operating for the last 40 years, of which, 15 have been in the Riviera Maya. I personally know over 350 couples that enjoy their Vacation Home with a hassle free lifestyle in the Mexican Caribbean. This article will briefly show 5 essential things you should think about if you are considering buying a vacation home in the Riviera Maya, México. 1. Time.- How much time a year are you really going to use your vacation home? How do you want to spend your quality time at your vacation home every year? How much time and money do you want to invest in maintaining your vacation home when you are not using it? 2. Location.- Where in the Riviera Maya would you like to spend most of the time while on vacation? Who do you want to spend your vacation with? What activities are available at the location of your preference? Does the location have easy access to activities, services, restaurants and shopping? 3. Lifestyle.- Are you looking for a resort lifestyle or a place you can call your second home? 4. Price.- How much money are you willing to invest/spend to buy your dream vacation home? The majority of people that own a Vacation Home use it from 1 week to 3 months every year. They spend the rest of the year taking care of the property through a manager or real estate agent that will maintain it, and if possible rent it during the time that they are not using it in order to recover some of the maintenance expenses. The investment of their time and financial resources into taking care of their property becomes an every day responsibility while they are using it and while they are not, because when they get to use it, some of the time is also invested in meeting with the manager or real estate agent that manages it, paying bills, fixing furniture and appliances as well as other daily chores. My recommendation is that you make sure that whom ever is taking care of your property saves you as much time as possible, is a professional and dependable individual or company, and has good references. It is also important to consider the investment of your time into this equation. *This costs do not include your travel expenses. Depending if you are a retiring couple or a young family, you will have different requirements to which it is important that you have easy access. Whether it is to experience an activity you love, or to get every day groceries; knowing where and with whom, is key to enjoying your quality time. The Riviera Maya is full of great locations, I personally have found that Private Residential Communities are the best options to get it all in one. You may choose an activity for the whole family, or each member of the family may choose a different activity. Then meet up for lunch or dinner and share experiences. My favorite is Puerto Aventuras a great location with easy access to every activity and need in a sophisticated, yet laid-back lifestyle. When spending your leisure time, the one thing you will remember is Lifestyle. When you have decided that you want to own a Vacation Home, usually it is because you love the place, and want to be able to spend more time and experience something more private than a Hotel. You are probably looking for your own private space, one that you can call your home away from home, and this is where it gets tricky. How can you own a Vacation Home with out all of the hassle and chores of a second home, and all the expenses it represents? You want a vacation lifestyle that goes along with owning a second home. A Hassle Free Lifestyle ensures that you may decide what to do with your time, and that usually comes at a high cost. By now, you are probably wondering if owning a Vacation Home is still a good idea. Or, can you experience an affordable hassle free lifestyle, and at the same time, own a Vacation Home? The average price of a Condo in the Riviera Maya goes from $175,000.00 to $450,000.00 USD and the furnishing and equipment may go from $6,000.00 to $65,000.00 USD depending on your taste. Previously I showed you what the minimum maintenance costs are depending how much time a year you use it. Remember you still have to add the travel and onsite expenses. This is why most of the people turn to timeshare, and even though they spend a lot less than owning a vacation home and have a hassle free lifestyle, they end up still unsatisfied, because it is not home away from home, is a hotel lifestyle without the privacy and intimacy of your own home. Here is the 3 things that over 350 couples are enjoying at their Hassle Free Vacation Home in the Riviera Maya. 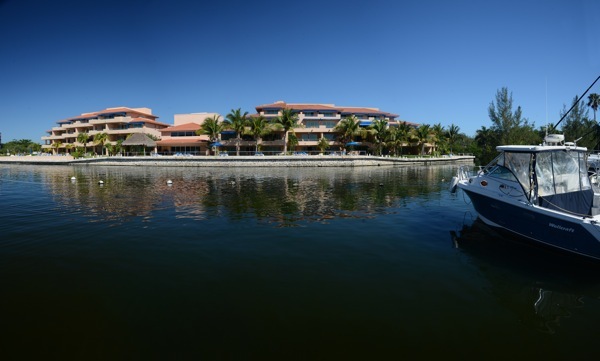 Puerto Aventuras, a 730 acre beautiful residential and touristic Beach, Marina and Golf Community with a laid back yet sophisticated and safe lifestyle in the heart of the Riviera Maya. Located 1 hour from Cancun Airport, 15 minutes from Playa del Carmen and 25 minutes from Tulum. Very close to the “Cenotes” area in the highway, in front of a Supermarket and it has easy access to every water and land activity: fishing, sailing, diving, snorkeling, kayaking, paddle-boarding, kite-surfing, Golf, Tennis, Fitness Center, Beach Club, Restaurants & Bars, Art Galleries, Shopping and even a museum and cultural events. There is something for every taste of lifestyle. 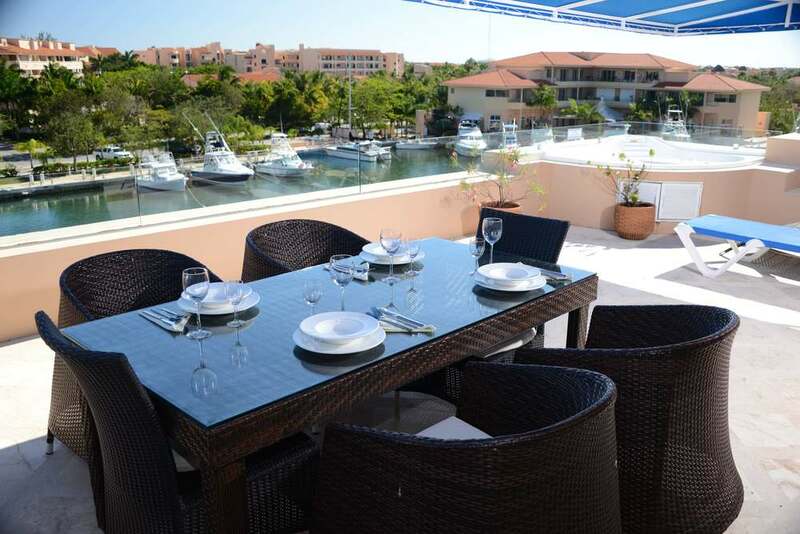 You are in your vacation home, a luxury fully furnished and equipped 1,600 sq. feet two bedroom Condo. Pampered by services to get all of the basic chores off your shoulders and a welcoming staff that takes care of the maintenance of your home, with even daily cleaning. You are now enjoying your morning coffee or orange juice from your spacious veranda. 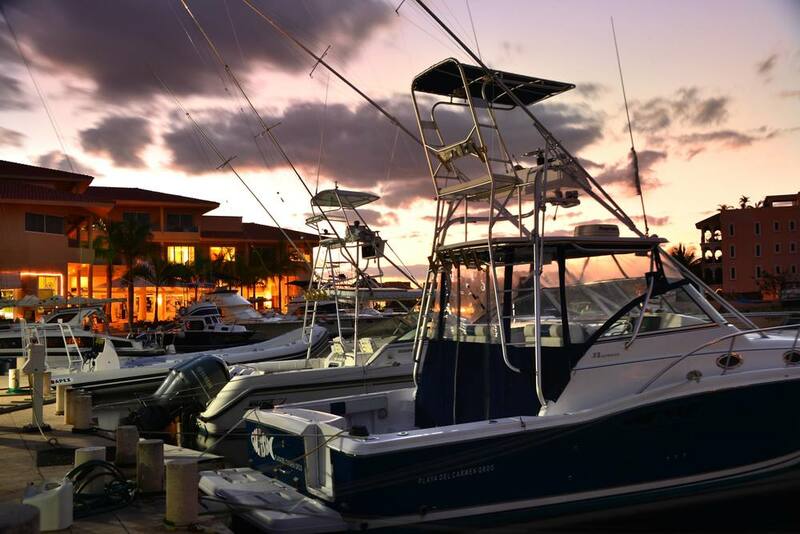 It is embellished with a private hot tub and views of green gardens overlooking a lap pool and the sun-splashed Grand Marina canal, its gleaming fishing fleet and yachts at rest in the quiet waters and natural life activity of tropical birds and jumping fish. You experience a sense of community that has naturally developed amongst owners from all over the world, with which you share common interests and with whom later that day you will go to play Golf, Fishing, Dining or Shopping. You have now made once a year friends that you meet every time you decide to visit your piece of paradise. 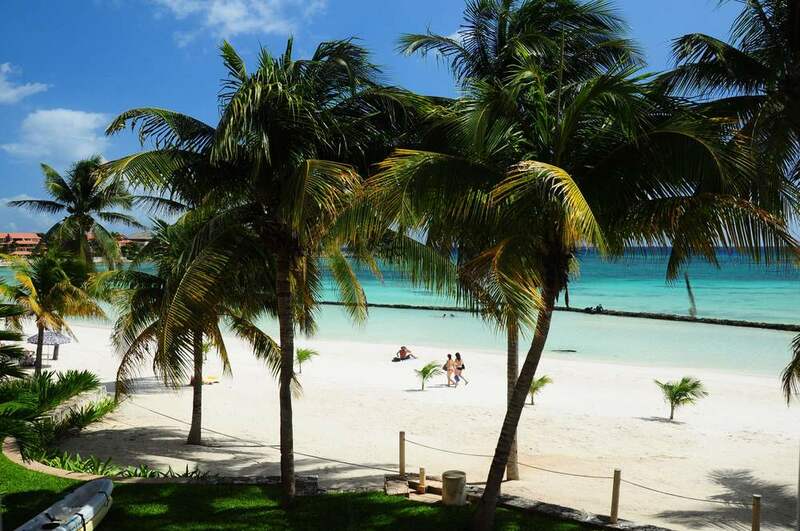 Visit the Beach Club with an International Cuisine Restaurant, swimming pools, massage parlor and a Jacuzzi Bar where while sipping a Lemon Margarita you enjoy the view of the turquoise waters of the Mexican Caribbean. After a delicious coconut shrimp lunch, you return to your clean Condo and contact the onsite Concierge to request information about Spanish Classes that you want to experience the next day, and which is the closest “Cenote” to visit that day before you prepare to go out dining with your new friends. Now imagine you may choose a scenario like this every day and you are not in a hotel, but in your own second home. The owners of this Condominium have purchased The Alternative, known as Porto Bello Private Residence Club. They have been able to choose and purchase, 1 to 6 months of the year, a specific 1, 2 or 3 bedrooms Condo and own it for a fraction of the full price. Starting at $70,100.00 USD their property rights are guaranteed by a Real Estate Deed and are as safe as purchasing any other property. They have bought the time that they really use every year, and if for whatever reason, they will not be able to use the full amount of time that they bought, they may rent it through the rental pool and make an extra income. Their ownership also allows them to trade weeks with Interval International, giving them the world to choose from and experience. With this feature some owners visit Porto Bello one week of the year and they trade with Interval International the other three to visit new and exciting locations. Some clever owners rent two weeks and use the other two of the month they bought; with the rental income, they pay the maintenance fee and their travel expenses. Others own 3 to 6 months of the year to get away from the cold. With this kind of property ownership, almost everything is possible. How would you use it?